I have two super-excited children. 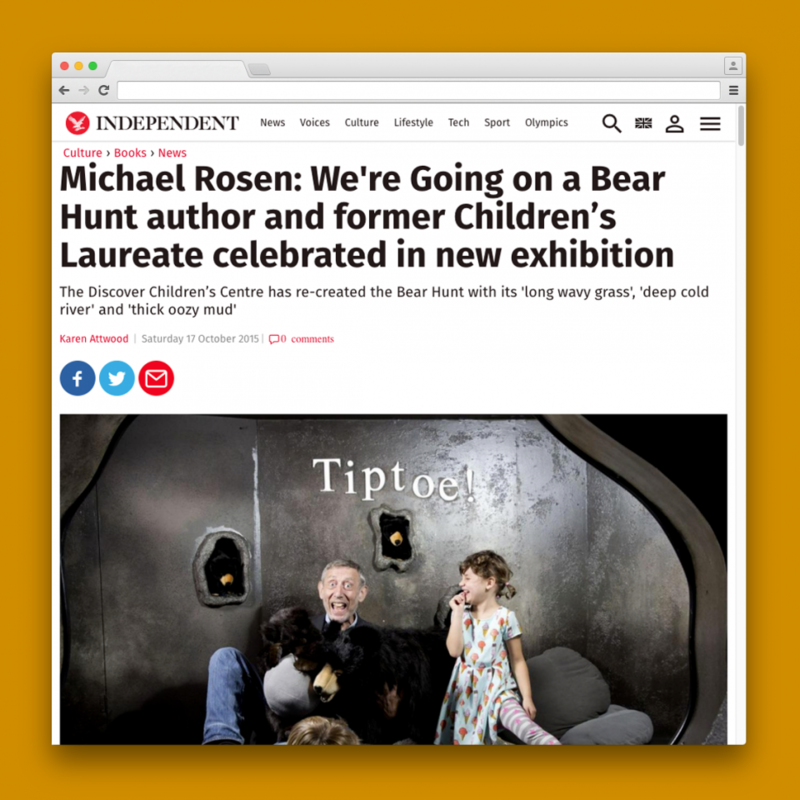 We’re going on a bear hunt with the poet who wrote the much-loved children’s book. “We’re going to catch a big one. It’s a beautiful day! We’re not scared,” sing Yasmin, five, and Isaac, three, on the way to The Independent on Sunday’s exclusive sneak preview at an exhibition about the most famous works by Michael Rosen, the former Children’s Laureate. “It’s wonderful to see it all come to life. I’ve been making an exhibition of myself for 40 years so it’s good for other people to make an exhibition of me,” says the award-winning author, 69, before being pulled away by Yasmin into a cave where they find some rather cuddly bears. The Discover Children’s Centre in Stratford, east London, has magically re-created the Bear Hunt with its “long wavy grass”, “deep cold river”, “thick oozy mud” and “swirling whirling snowstorm” with all the sound effects recorded by Rosen. His grandparents’ living room and the writer’s old classroom in Pinner are also brought to life as examples of his sources of inspiration. In the classroom, Isaac is most taken by Fluff the Farting Fish. There’s also a Dread Shed full of nasties such as the aromas of smelly feet and rotten fish, and a Chocolate Cake kitchen where a screen shows Rosen hilariously performing his poem of the same name. Throughout his career, Rosen has inspired children and adults to fall in love with reading. He is well known for his stinging criticism of government education policy, in particular the reforms brought in by former Education Secretary Michael Gove. As a parent of a five-year-old undergoing spelling tests every week – brought in under Gove – I ask what I can do to ensure my daughter retains a sense of wonder about learning. He says comparing different education systems makes no sense at all. Instead, parents can compensate for the pressure by “encouraging children to come to a place like this and just let them play”. Rosen has announced the creation of a new prize for funny books, the Lollies, launched with the support of the publisher Scholastic. “We are always talking about encouraging reading for pleasure and we talk about it in an abstract way, but it’s concrete. If you put a funny book in a children’s hand there is every chance that they will discover that reading is fun,” he says. It’s time to go and I have to drag my children “back through the snowstorm, back through the forest … and back through the grass”. The verdict: we are going on a bear hunt again!